Yesterday was a very busy and exciting day for us…not that most days aren’t busy and exciting, however, yesterday we participated in the Northwest Food & Wine Festival in Portland Oregon. 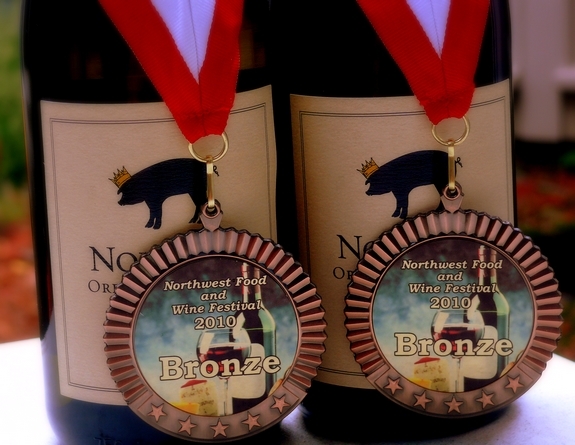 We are proud to announce that both our Noble Pig Pinot Noir and Pinot Gris both won bronze medals in this very stiff competition of amazing Northwest wines. 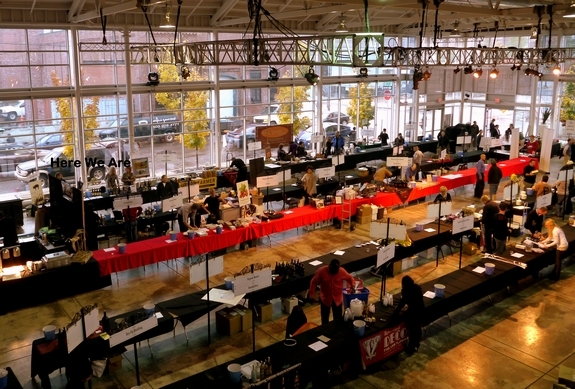 With over 600 participating wineries and other vendors, only 70 medals were awarded. Only 12 Pinot Noir and 4 Pinot Gris wines were given medal status and we are so proud to have been one of the recipients!! A big thank you to all our readers who came out and tasted and took home some of our wines. It is always such a thrill to meet you all in person. And another big thank you to all the event guests whose kind words and purchases made our hearts full. Here is a shot of the venue before the event started, Pure Space, in the Pearl District of downtown Portland. Our table was located at the top left. With 1500 guests, and hundreds of event participants, it was a busy night of wine pouring, noshing and schmoozing. We loved it. There was amazing food and wine at this event….I wished I could have tried it all. I think the chocolate-covered bacon was one of my favorites. Again, thank you all for your support in making our small, family business a success. We couldn’t do it without you. Congrats, will be serving both Thanksgiving. Your wines are fabulous, which is why I’ve ordered them 3x already…and I need more! Congratulations are definitely in order. We have loved to follow you on this journey. Congratulations on realizing your dream here in Yamhill County! Congratulations! You totally deserve it! Now, pardon me while I go update my auction program! Congratulations! What wonderful news! I think I have someone in Pa. I can ship my wine to. Hopefully I will finally be able to sample it myself! This nearly brought me to tears trying to tell my husband how great your accomplishment has been. We have followed your journey now for nearly 3 years. Congratulations! Congrats!! That is so exciting. I am even MORE proud to be serving your pinot at Thanksgiving! Congratulations! It’s so exciting watching your progress as you work toward your dreams. What an exciting award!!! Congratulations!!! Congrats all around! This is wonderful! Spending time with family is the key to a great Christmas……Mom (87), husband, daughters, sons in law and wonderful grandchildren for an incredible feast. What could be better? Congratulations. I can’t think of anyone more deserving. I’m getting ready to make another wine order, definitely a bigger one than last time. I don’t want to run out too quickly! I commented on your wine blog, but wanted to congratulate you again on your award winning wine production. The quality of your wine deserved the recognition, and you and your family deserve to be contratulated after all the hard work you put into this project. I am proud to be a part of Noble Pig family of readers! Congratulations! That’s incredible – good for you and well deserved. Congratulations!! What a great way to start the holiday season. Making a marzipan dome torte! Congrats! Great to hear that all your hard work is already paying off! Congratulations on your success at the wine show. You both must be so proud!!!! Congrats! We’ll be serving both during the holidays.